Tomatoes are everywhere, stacked in beautiful piles at farm stands. I always knew that we were in the dog days of summer when My Mother picked tomatoes from our suburban garden and lined them up on a windowsill to ripen. She made BLT sandwiches, tomato sandwiches, and a salad of tomatoes, cucumbers, and onions dressed with red wine vinegar, oil, a pinch of sugar, and salt and pepper. Too bad I don’t like tomatoes. I should clarify. I don’t eat raw tomatoes. I don’t like the acid or the texture. I don’t eat soups or sauces made with tomatoes that haven’t been seeded or peeled. When dining out, I even inspect marinara sauce and pizza for seeds and skins. Actually, I never order marinara sauce in a restaurant. Today, I want to talk about what I do with fresh tomatoes in tomato season. Oh, I know what people like with their tomatoes. Just because I’m plagued with Picky-Eater Syndrome doesn’t mean that I can’t figure out how food should taste (as usual, I realize that I’m not making sense to most of you). For our church cook-out this Sunday, I’ll make a platter of sliced tomatoes drizzled with a best-quality olive oil and garnished with sliced or fresh mozzarella, salt and pepper, and fresh basil. The Veterinarian liked his tomato salad with Vidalia onion, but raw onions are a fellowship-killer, if you know what I mean. Blessed with wonderful friends and clients in our veterinary practice, we never had a shortage of seasonal produce. Once I learned to peel and seed tomatoes efficiently, I turned them into soups (Julia Child’s “Potage Magali,” a Mediterranean tomato and rice) or salsa or jambalaya or traditional tomato sauce, which I froze in baggies. In researching this recipe, articles repeatedly mentioned that it was an “American” pasta dish, not authentically Italian. Curious, I pulled out my American edition of the Italian classic cookbook “The Silver Spoon” (“Il cucchiaio d’argento”), and there it is on page 298. Now, this was advertised by Phaidon, the publisher, as “The bible of authentic Italian cooking.“ If the online authorities are correct, the Italians have borrowed an Americanized Italian dish; the great Melting Pot is flowing east, across the Atlantic to the Old World. However, “The Silver Spoon” contains no recipe for that known New World creation, Fettucine al Fredo, so I question the online authorities. But, really, who cares? 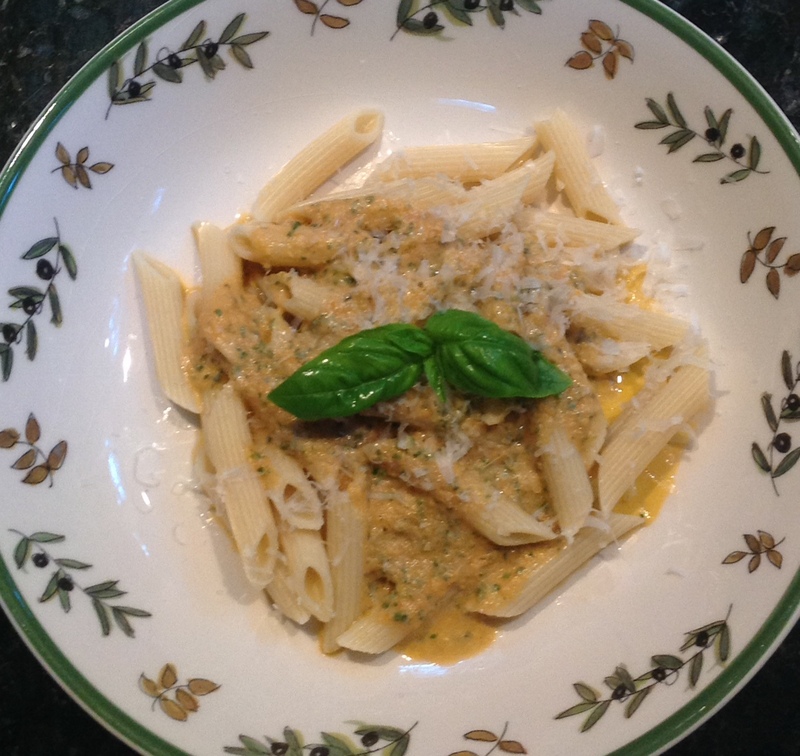 Each online recipe is different (some include bacon or oregano, almost none have fresh basil), so which is the “authentic American penne alla vodka”? In the culinary world, where the word “fusion” gets attached to traditional cuisine to indicate a blending of cultural influences, perhaps this is “Italian Fusion.” Cooking is all about improvisation, using what’s available, using your own preferences or dietary requirements, creating something out of nothing, like art. As a picky eater, I’ve been creating culinary art as long as I have been cooking. That’s why I always recommend that you start with recipes and adjust them until they taste right to you. Yes, it’s trial and error, and you’re going to err — a lot, in the beginning, but cooking with a fresh eye is an art and incredibly satisfying. I have so little control over the rest of my life, but, when I’m in my kitchen, or even cooking in someone else’s, I am the Mistress of my Domain, so who am I to complain? Life is good (mostly). Soli Deo Gloria! I should explain the name. When I saw this made on television, the chef included mushrooms, which aren’t on this picky eater’s palate. Thankfully, the Veterinarian and the Daughter weren’t even remotely as picky, so adding sautéed mushrooms gave the delicate sauce a little heft. I imagine that you could also blend some of the cooked mushrooms into the sauce, but I wouldn’t eat that. It isn’t difficult to peel tomatoes, but it’s a little trickier to seed them. Bring a pan of water to boil and put in your washed tomatoes. Return to a boil and simmer for three minutes. Remove and plunge tomatoes into a bowl of icy water. When cool, skins should slip off easily. Cut the tomatoes in half and remove seeds and the stem end. Measure tomatoes after peeling and seeding. One last caveat: Be sure to heat the sauce carefully after the vodka is added. I once was gabbing with a friend on a flight and writing this recipe and my recipe for tortellini with prosciutto, peas, and fresh basil for her from memory. Not paying attention, I wrote the ingredient “vodka” at the end and forgot to write “heat the vodka until the alcohol evaporates” in the directions. My friend and her husband were overcome by the sauce in more ways than one. By the way, this is the same veterinary spouse who ate my splintery cheesecake. It’s a wonder she trusts any recipe that I give her! In a 2-quart saucepan, heat butter and oil over medium-low heat until butter melts. Add onion and garlic and sauté until soft. Stir in tomatoes, cook for one minute; stir in whole basil leaves, salt, and pepper, and simmer for five minutes. Remove from heat and add vodka. Return to heat and simmer for two minutes or until alcohol evaporates. 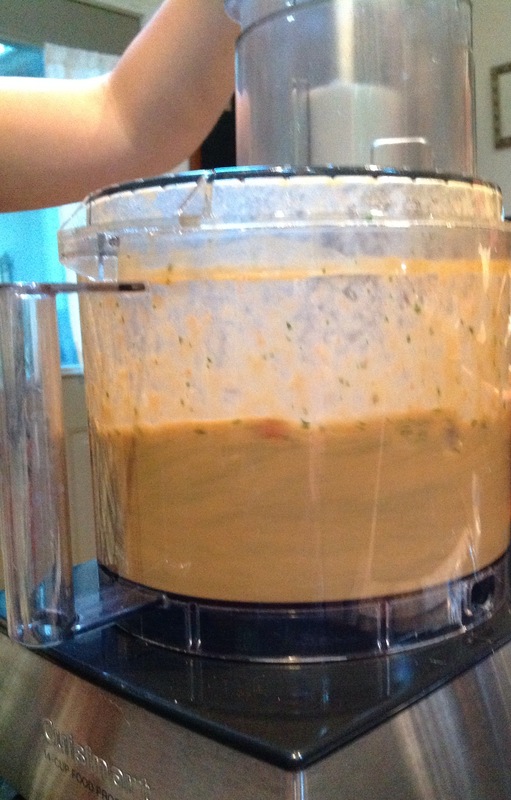 Remove from heat and carefully spoon mixture into food processor or blender. [Or use an immersion blender right in the pan.] Add heavy cream and process just until blended but still chunky. Return to pan over low heat. Adjust salt and pepper to taste or add in optional red pepper flakes to taste. Stir in optional mushrooms. Heat through. 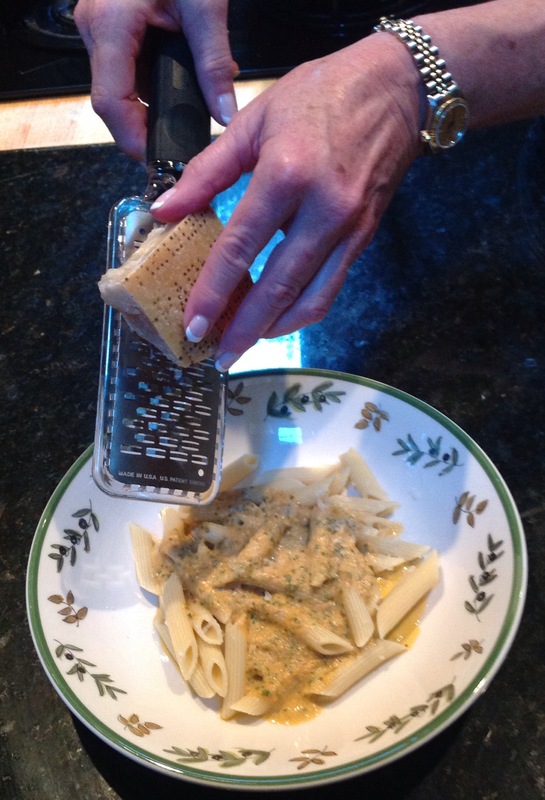 Spoon sauce over hot penne rigate in individual dishes, garnish with freshly grated Parmesan and with fresh basil sprigs. Makes four servings, without the mushrooms; six with the mushrooms. 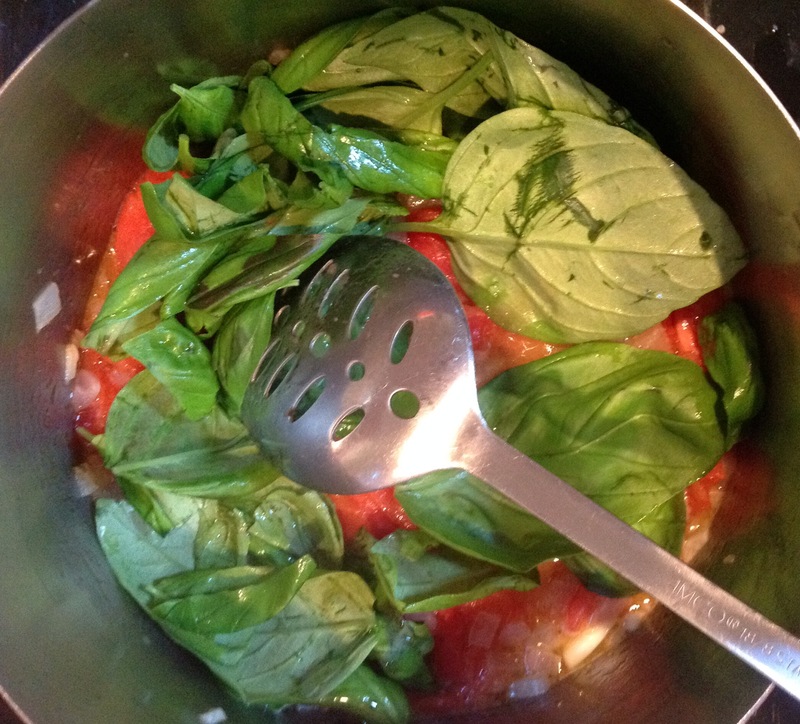 Categories: Food, Recipes | Tags: basil, Cooking, pasta, recipes, tomatoes | Permalink. Another great story. I can relate to just about everything you wrote. If this was in book form I wouldn’t be able to put it down. You are a fantastic writer! Thank you for the enjoyment of getting to read what you bring to life. Thanks so much for the encouragement, Dolly! I just try to write for and about people who grew up like we did. No matter where I go in life, who I meet, what I do, I always take that girl from our little Allen Park with me.